Referee Pascal Gauzere shows Campese Ma'afu a red card. He also disallowed two Wales touchdowns. Wales coach Warren Gatland asked for consistency from referees after his side's 17-13 win over 14-man Fiji. The Kiwi felt his side were on the wrong side of decisions by Pascal Gauzere, who dismissed Campese Ma'afu for two yellow card offences. Gatland was aggrieved when a try by Taulupe Faletau was ruled out after a television referral. 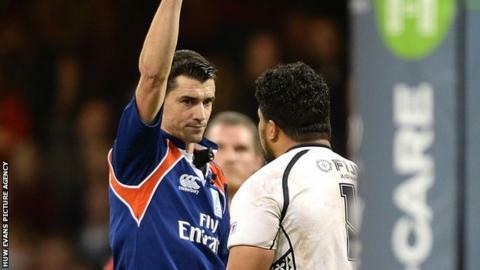 "When the TMO is saying it's a try and the referee just makes a decision it's frustrating," he said. "All we're asking for is consistency and we're not getting it." Wales led 17-6 at the interval thanks to touchdowns by George North and Alex Cuthbert and a penalty try. But they failed to register a point in a second half that saw Fiji play 27 minutes with 14 men after Ma'afu's dismissal. And an interception try by Nemani Nadolo three minutes from the end led to a tense finish at the Millennium Stadium. Gatland acknowledged that his team were wasteful, particularly behind the scrum. But, despite Wales conceding a number of turnovers to the Pacific Islanders, he felt his pack played well and was not too concerned with problems at the breakdown. "If you look back we've been penalised a couple of times on the ball, there have been a couple of turnovers we're looking at," added Gatland. "We're looking at it but a quality ref in the middle will make a difference as well. It's frustrating really. "We've gone out there to try and play some rugby but there's been a lot of turnovers and I didn't think we had a number of calls go our way. "They tried to slow the game down and we probably butchered a number of opportunities and we were frustrated by that. "I thought it was pretty good by the forwards, but not clinical enough behind in terms of backline and accuracy and finishing off opportunities." Wales face world champions New Zealand in their next match on Saturday, 22 November.